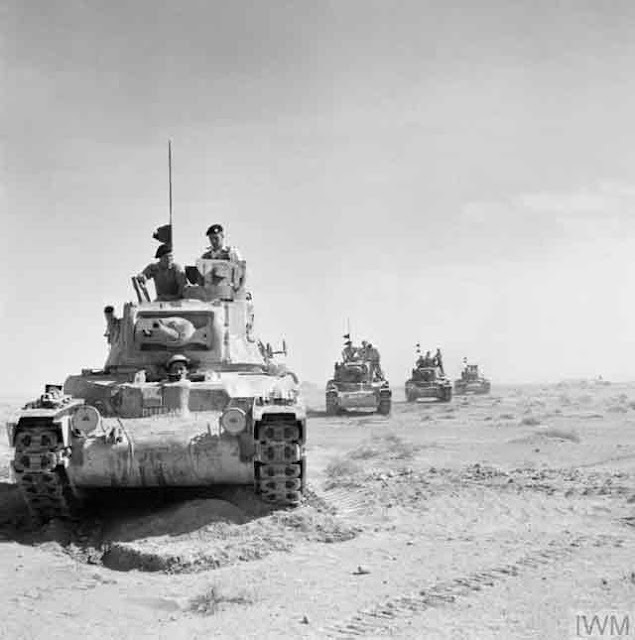 British Matilda tanks on a sortie outside the Tobruk perimeter on 18 November 1941. Battle of the Mediterranean: After several months of relative quiet on the North African front, the war erupts again into a hail of gunfire on 18 November 1944 when the British launch Operation Crusader. This is an attempt by the British Eighth Army, led by General Sir Alan Gordon Cunningham, to relieve the besieged garrison of Tobruk and, most optimistically, push the Afrika Korps led by General Erwin Rommel back across Cyrenaica. 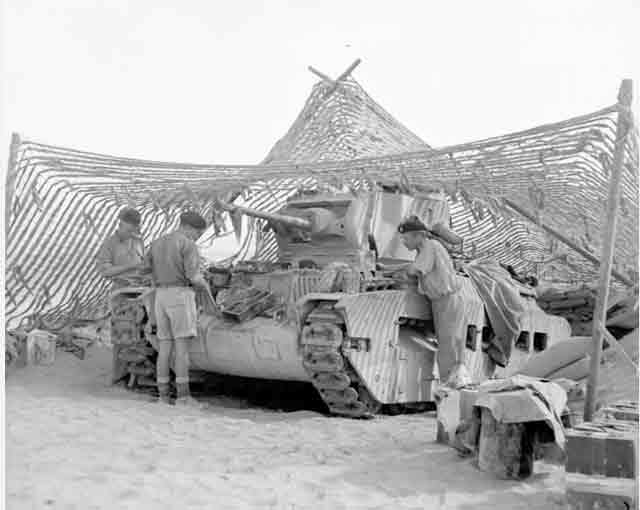 A British Matilda tank being prepared for operations at Tobruk on 18 November 1941. Operation Crusader is launched by British 30 Corps under Lieutenant-General Willoughby Norrie and XIII Corps under Lieutenant-General Reade Godwin-Austen. Their forces will be augmented if they can free the Tobruk garrison, composed of 32nd Army Tank Brigade, and the Australian 9th Division which (in late 1941), was in the process of being replaced by the British 70th Infantry Division and the Polish Carpathian Brigade (commanded by Major-General Stanisław Kopański). 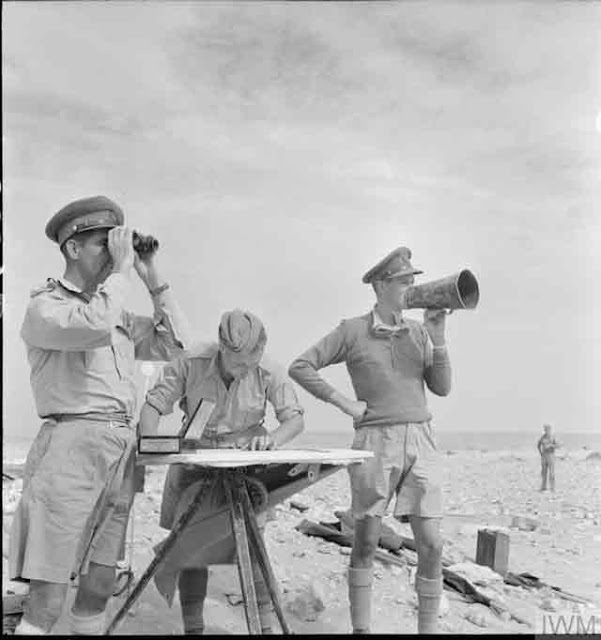 British Major General Ronald Scobie commands at Tobruk, which has been supplied by nightly runs of fast destroyers and minelayers based at Alexandria. 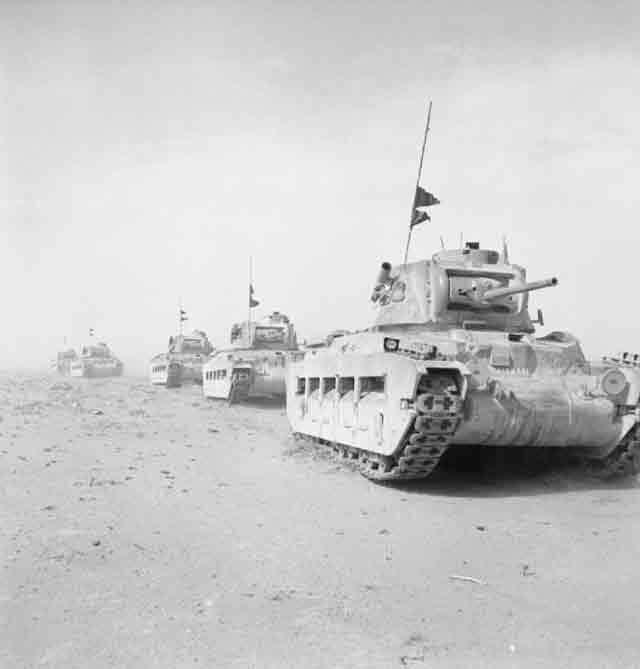 "Matilda tanks on the move outside the perimeter of Tobruk, 18 November 1941." © IWM (E 6600). Opposing the British is Panzergroup Afrika. Its main force is Afrika Korps under the command of Lieutenant General Ludwig Cruwell. Cruwell has at his disposal the 15th Panzer Division, 21st Panzer Division (total of 260 tanks ), the Division z.b.V Afrika which had been formed in Africa as a composite formation, and was renamed the 90th Light Africa Division in late November, and the Italian 55th Infantry Division Savona. While General Rommel is under the command of the Italian High Command and is subject to the orders of General Ettore Bastico, Rommel exercises a completely free hand in operations and treats Cruwell almost as his chief of staff. Everybody understands that this is a German show and that the Italian soldiers are of limited value, though they are necessary and useful when handled properly (i.e., given static tasks and "corsetted" by always keeping German units nearby). "The crew of a 25-pounder gun in Tobruk, 18 November 1941. They are members of the Royal Horse Artillery." © IWM (E 6572). The main limitation of Rommel's forces has been resupply issues. Panzer Group Africa depends almost entirely on convoys from Naples (via Palermo) to Benghazi and Tripoli. Supply also depends upon transport from the ports to the front, which very often is lacking. About 75% of convoys get through, though there are some instances when none of the ships arrive at all, such as the 9 November Duisburg Convoy. The main problem is the fuel for the panzers because as much as half of the gasoline that arrives in North Africa is used up by transporting the remainder to the front. Convoys that might be sent are often delayed or eliminated entirely by the sinkings in the Sicilian Strait. The land convoys to the front also are vulnerable to RAF attacks both from Malta and Egypt. The Luftwaffe is much weaker in North Africa late in 1941 than it was in the spring due to the demands of the Eastern Front, which has sucked up resources that otherwise could have supported Afrika Korps. Hitler appoints Air Field Marshal Albert Kesselring as Luftwaffe Commander in Chief South as his effort to improve the convoy situation. Kesselring immediately transfers his Luftlotte 2 headquarters (but not its forces) from Russia to Rome. 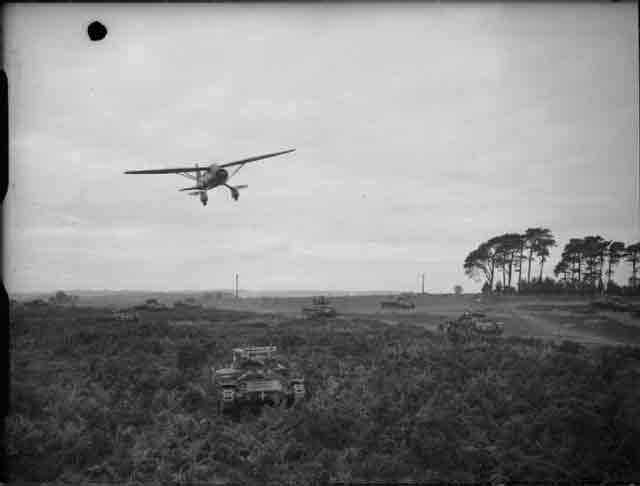 "An RAF Lysander aircraft from Army Co-operation Command flies low over Valentine tanks during an exercise, 18 November 1941. The tanks are marked with crosses to indicate 'enemy' vehicles." © IWM (H 15604). The British are in much better shape than the Germans in North Africa. General Cunningham has built up an armada of 770 tanks (including many of the new Crusader Cruiser tanks, after which the operation was named, and many new American M3 Stuart light tanks supplied by Lend Lease via Suez). The British forces include South African, New Zealand, Indian, Australian, and Polish troops in discrete units. The RAF has over 700 combat aircraft under the command of Air HQ Western Desert. The Royal Navy is a constant factor because much of the action takes place along coast roads and in ports which are easily shelled during night-time sorties from Alexandria. 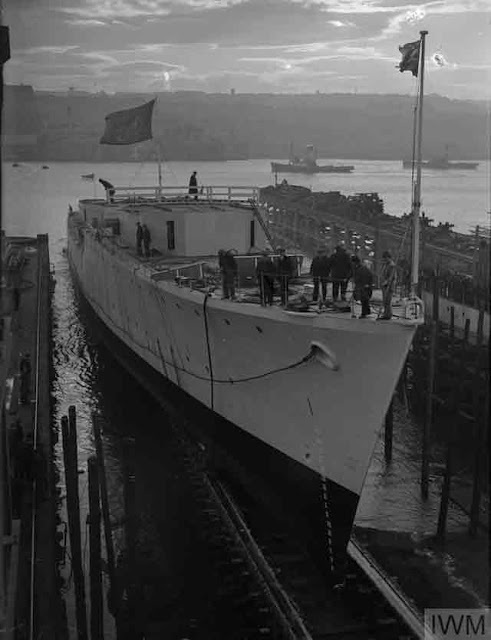 While the Italian Navy on paper is superior to the ships of the Royal Navy's Mediterranean Station, it is well known to prefer to stay in port as a "fleet in being" both through timidity induced by early war losses and fuel issues. While the Kriegsmarine does have a presence in the Mediterranean, it is a minimal one which is disguised by some flashy successes such as the sinking of Royal Navy aircraft carrier HMS Ark Royal on 13-14 November 1941. 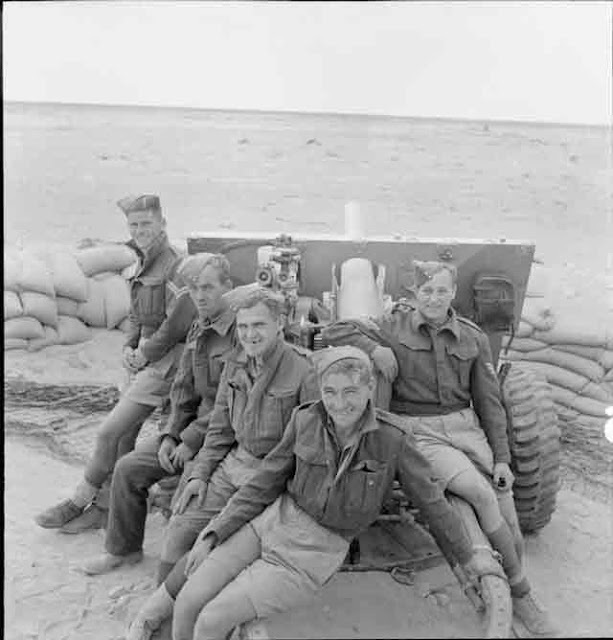 "The Command Post for the Royal Horse Artillery in Tobruk. The Troop Commander can be seen using binoculars to see where shots land and the gun position officer is using a loudspeaker to give the fire order, 18 November 1941." © IWM (E 6577). The British Eighth Army attacks before dawn from its base at Mersa Matruh and crosses the border near Fort Maddalena. From there, about 50 miles (80 km) south of Sidi Omar, 7th Armored Division's 7th Armored Brigade heads northwest toward Tobruk with 22nd Armored Brigade screening its left (western) flank. This attack is made through "no man's land" and there is virtually no fighting on 18 November. 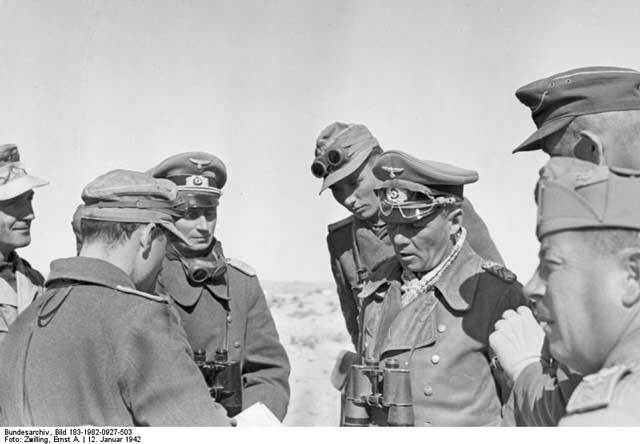 However, due to rain late on the 17th, the RAF Desert Air Force was unable to launch raids on Luftwaffe fields and Wehrmacht troop concentrations, so General Rommel begins the battle with his forces basically intact. He immediately orders 21st Panzer Division to move south from Gambut. The panzers are supported by powerful 88 mm gun batteries which can be used as both ground artillery and anti-aircraft fire. The initial flashpoint will be Sidi Rezegh airfield, which both sides need to support ground operations around Tobruk. 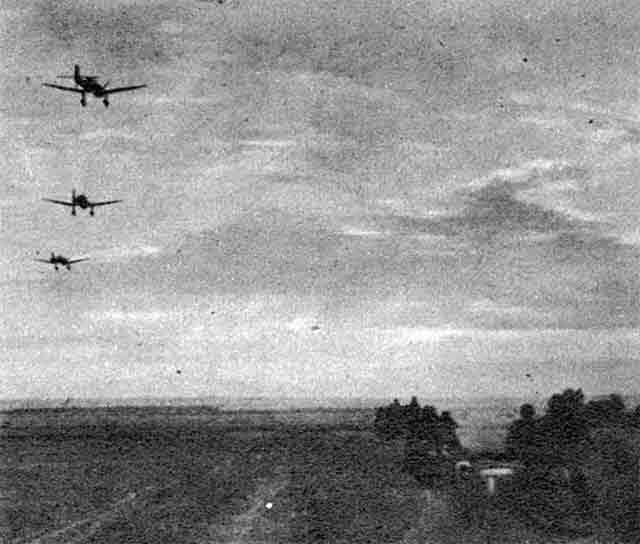 Stukas flying ahead of ground troops in Russia. A standard Wehrmacht tactic is to use dive bombers to open a hole in the enemy line for ground troops to quickly fill and thereby undermine the defenses. This photo was in the 18 November 1941 Der Adler but undoubtedly was taken months earlier (other photos are from September 1941). Japanese Military: The first Imperial Japanese Navy ships begin leaving Japan (some from Kwajalein, which is under Japanese administration pursuant to a League of Nations Mandate) directly for Pearl Harbor. These include five large Japanese carrier submarines, HIJMS I-16, I-18, I-20, I-22, and I-24, which sail from Kure Naval Base. Each of these carries a midget sub lashed to its deck. Another nine ships leave Kwajalein. The main IJN carrier force of Kido Butai, the invasion operation, sails from Saeki Bay for Hittokappu (Tankan) Bay, awaiting the final order to sail east. The Japanese continue to negotiate in Washington for a peaceful settlement and do not tell even their German allies of their military plans. Security is very tight, and not even the American Magic decryption operation led by Joseph Roquefort has an inkling that the invasion fleet has sailed. "HMCS ATHABASKAN leaving the slips after the launch by Lady Tweedsmuir." 18 November 1941, Newcastle. © IWM (A 9611).